Powers/Abilities: Able to merge with and absorb the properties of things, both objects and energy. History: David Banner was a scientist working for the U.S. Army on atomic weapons research and genetic engineering of soldiers. Refused permission to test his genetic modifications on human subjects, he experimented on himself, an act which would later have terrible repercussions for his son, who was conceived a few months later. His child Bruce would one day become the being known as the Hulk as a consequence. His boss General Ross discovered what he had done eventually, and fired him. This drove the already unstable David Banner over the edge, and in a fit of rage he attempted to murder his son, fearing what the child might become. His wife Edith tried to stop him, and in the ensuing struggle David stabbed her to death. Ross arrived in time to prevent him killing Bruce as well, and saw to it that David Banner was locked up for a long time. Decades later David Banner was released. He tracked down his now adult son, and was present to witness his first transformation into the Hulk. David Banner used the same procedure that had transformed his offspring to create first a trio of gamma-powered dogs, and then on himself. This final mutation turned him into a being able to merge with and absorb the properties of minerals and energy. He allowed the military to arrest him, on the understanding that he was allowed to see his son one last time, but during this final meeting, he absorbed a massive dose of electricity, turning into an energy being that battled the Hulk. David Banner's energy form apparently dissipate in the end, killing him. 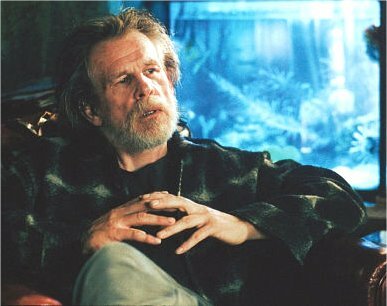 Comments: Played by Nick Nolte. David Bruce Banner, the name of the television Hulk, which is probably where they got the idea to name Bruce Banner's father David in this incarnation.